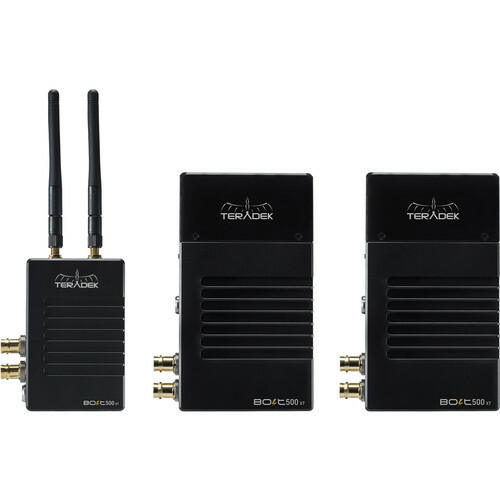 The Teradek Bolt 500 XT 3G-SDI/HDMI Wireless Transmitter and Receiver Set includes one transmitter and two receivers. This enables you to immediately start transmitting up to 1080p60 video from either an SDI or HDMI source. The zero-latency transmitter/receiver pair features a 500' line-of-site transmission distance. You can send and receive visually lossless 3G-video signals from a Bolt 500 transmitter with zero latency. The transmitter features cross conversion, so you take an SDI signal in and loop out either an SDI or HDMI signal to your on-camera monitor. The receiver also features both SDI and HDMI outputs, and the system supports digital SD and HD signals. Although the inputs and outputs support a variety of HD signals in both 50 and 60 Hz standards, as well as 480i and 576i, only HDMI supports 480p and 576p. You can transmit up to three other 3rd-generation Bolt receivers as the transmitter can support up to four receivers. The built-in AES 128-bit encryption helps keep your transmitted video safe from prying eyes.